That’s it. The New Krypton saga is now over . War of the Supermen #4 marks the end of a saga that in our opinion — is one of the greatest Superman story arcs of all time. It began with Kandor coming out of the bottle and ending up as a city on Earth – then they got their own planet and called it New Krypton — that got blowed up real good so the Kryptonians came to Earth to trash it. 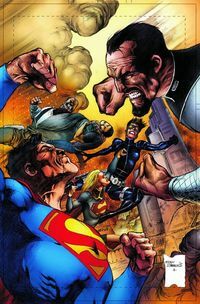 The trashing of Earth – that’s the basic War of the Supermen story and it comes to an end in War of the Supermen #4. In the end, General Zod gets banished back to the Phantom Zone, General Lane dies and Metropolis goes back to its (not so) normal self. Overall the New Krypton saga has been an incredible ride. We saw the first issue on the stands and it was the first time we actually bought a Superman title in at least ten years. It was New Krypton that pulled us back into the Superman universe. Here we had the Man of Steel, as not unique- but being one among many. A superman on a planet of supermen. On New Krypton, Superman was just Kal-El. He was a ‘regular’ guy and he ‘technically’ for a time reported to Zod and even took over for Zod when Zod was out of commission for awhile. One Kryptonian came to Earth and helped make it a better place. We made him our greatest hero. 100,000 Kryptonians came and they were seen as a threat. They were met with suspicion, hatred and eventually death. We–humanity–were incapable of accepting what they had to offer, accepting that change, so we lashed out at them. Destroyed them. New Krypton gave us a different perspective on Kal-El and one that we looked forward to reading often and regularly. Will we now continue to pick up Superman titles? 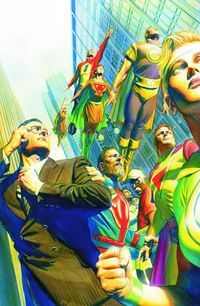 That remains to be seen, but now that the New Krypton saga is done, how can anything else not be a letdown at this point? 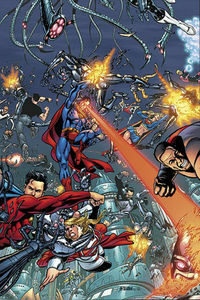 This comic book is all about one thing – the destruction of New Krypton. No we didn’t see this coming. After two years of following the New Krypton saga, we’ve grown fond of the place. New Krypton/Kandor has been part of the Superman universe for what 40 years or more at this point? and now it’s GONE. And all destroyed by Luthor/Lane via Reactron — killer of Supergirl’s dad too – now killer of her mom and Kandor itself. 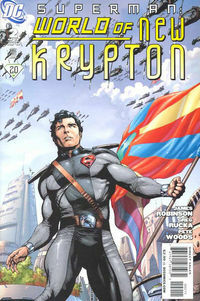 Superman New Krypton is a great series and this issue finally puts Kal-El – commander El in his rightful place. With Zod shot, Commander-El now runs the military! 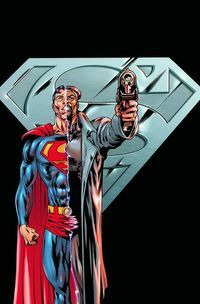 But the dude that shot Zod ran to Earth..and so now for the first time in months..Superman is coming back to Action Comics and Superman (finally!). And he’s putting the suit back on – and not the military guild suit either. This series has taken a real interesting twist with Zod…after all Zod is supposed to be the bad guy right? But he’s not really the bad guy in this series (at least for the most part). We really enjoyed the New Krypton series which ended with Kandor flying off to create is own New Krypton. Now Superman in this series leaves Earth and goes to live on New Krypton. And he joins General Zod’s Military! 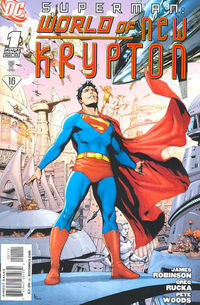 So here we are after 10 issue, the end of New Krypton. But it’s not really the end is it? Though officially this is the end of the New Krypton story arc – New Krypton itself has only just been born. Now instead of being in a bottle or stuck up in the arctic Kandor is it’s own world. 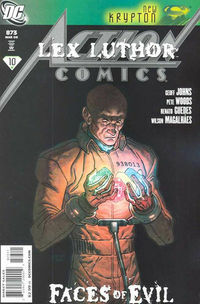 We never do find out what General Lane had in mind or what Lex Luthor was doing or even what’s going with Braniac. So many unanswered questions – that could have been answered in the 10 issues of this series. This was the first time we’ve bought Superman titles in 20 years or more – it brought us in but now we’re disappointed. If this had been a cleaner arc with a cleaner ending – sure there could be strings – but that would have been much more satisfying. As it is, sure this was a fun series, but we still feel somehow cheated. Will we keep buying Superman titles? Probably not. Then again, we do want to find out what happens next and no doubt there is a lot more that will happen next. 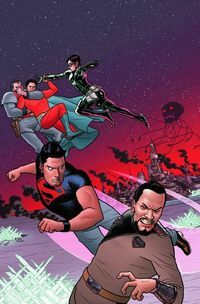 New Krypton races to its conclusion in this second to last issue in the New Krypton series. Finally – we get superman fighting his family! We get the followers of Zod fighting other Earth heroes and we get a fantastic issue of entertainment. 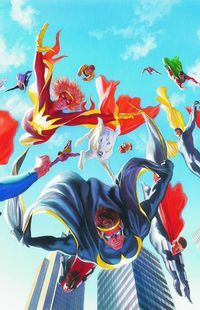 It’s unfortunate there is only one issue left in this series – it’s been great fun. Shocking. And Shockingly good comic too. We’ve become big Fans of the New Krypton series – it’s clearly not just business as usual for the man of steel. But the biggest plot twist of course is the Death of Zor-El – Supergirl’s father. It just seemed so sudden and brutal. It’s the kind of quick twist that makes this New Krypton series easily one of the best Superman plot line in the last 30 years. 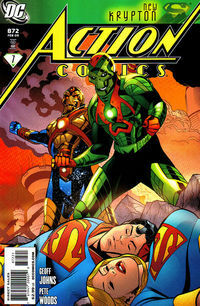 changed with this new storyline – Superman New Krypton – a nine issue cross-over event. (saving it in the process) and now Superman has saved the city and 100,000 Kryptonian’s are now living on Earth. 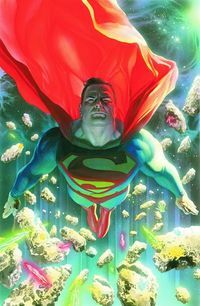 It’s a great premise and one that challenges the notion of Superman being special (supergirl aside) – since there are now 100,000 people just like him flying around Earth. from there to Supergirl (didn’t care for that issue). 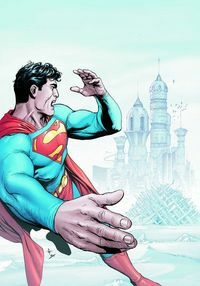 The latest issue is Superman #681 New Krypton part 6. The Kryptonian’s now actually kill humans and this is clearly a turning point. General Zod (remember him from the Superman II movie ?) still has followers loyal to him and they seem to be stirring up some trouble. Oh and remember the Phantom Zone ? Yeaaah it’s back too. So for this comic book fan – after years and years of not reading Superman regularly – here I am back reading Superman again thanks to this New Krypton storyline. It’s great that anew issue is out every week – which sure makes a big difference too.